The perfect sweater for seasonal changes is one that balances casual and formal and allows for a comfortable yet sophisticated look. As you plan for your next snowy vacation or simply need an everyday sweater that is work-appropriate, the oversized sweater can fit just right. LOversized sweaters can be found in several cuts and patterns, from the classic cable-knit, to stripes and argyle. Wearing one well comes down to how it fits into your daily life. The sweater dress is a cozy alternative to the basic black dress that works for office meetings und er blazers or on its own with a pair of heels. It effortlessly transitions from the office to a night out. Accessorize with a belt to create a comfortable shape, or with a simple, colorful clutch to round out an ensemble. Oversized cardigans easily add liveliness to an otherwise simplistic look. Choose a bright color to create eye-catching combinations or have a staple basic in black or grey to wear with everything, including dress pants or jeans and tennis shoes. A sweater’s neckline makes a statement with the way it frames your face. The looseness of cowl-neck sweaters can create a dramatic effect when hair is worn long and straight with similarly dangling accessories. The timeless classic, the v-neck sweater, draws the eyes up to the face and lengthens the neckline for a slimming appearance. The comfort of an oversized sweater can coincide with personal style that is worth showing off. Browse our collection for this season’s most up to date and truly wearable styles. With their soft texture and warmth, they are sure to round out your wardrobe and become a favorite for both your cozy nights in and your lively nights out. Empower yourself to look your finest this season. Whether you’re looking for a casual oversized sweater or something for a more formal occasion, Christopher and Banks has you covered. Not only do we offer a large variety of styles, but we offer a large selection of sizes, including petite and plus sizes. 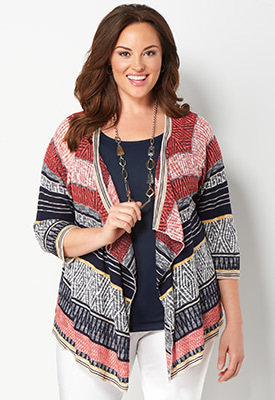 Browse our wide selection of women’s sweaters and find the perfect look for you!